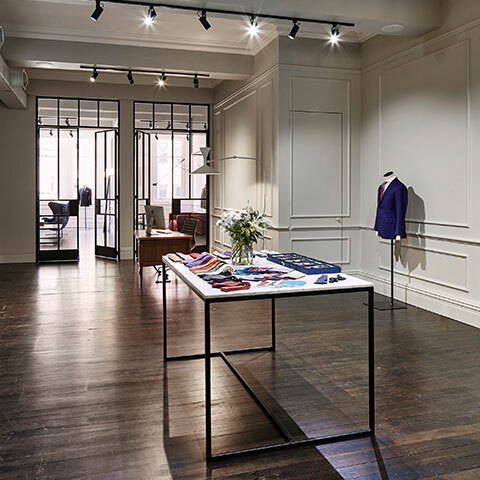 In both showrooms a dedicated glassed tailoring workshop is always on show, private fitting rooms look onto elegant skylines through soaring windows, and there’s a sophisticated lounge bar area for libations on the house. On display is a range of suit and fabric options, including the UK Huddersfield Cloth range and the premium Dormeuil cloth range, in addition to a full complement of gentlemen’s accessories including hand-made Italian ties and pocket squares, Dents gloves, Pasotti umbrellas, Albert Thurston braces, Alpaca scarves, Fortis Green socks as well as Oscar Hunt leather belts, cufflinks and tie-clips. Established in 2010, Oscar Hunt uses traditional methods to create your own distinct style. We are all about the relationship between tailor and client, working together to make sure each client becomes a suit connoisseur in his own right. We never compromise on our approach to style, and we know that style is based on classic beauty. We learn from maestros and mavericks, not magazines. Oscar worked as a bespoke tailor at Hemden Bespoke Tailors for five and a half years following on from his studies in fashion design. He became interested in men’s tailoring while working in womenswear. For Oscar, tailoring has a subtle elegance in the small changes to proportion, fit and finish between eras. These unchanging values and the allure of obtainable perfection are the reasons that he chose the world of tailoring.